So, is Katie running Boston or what? Unless we’re in for an April surprise, it appears not. For a while, I wondered if she intended to run every marathon I’ve entered. Just who is stalking whom? Well, I’m pretty sure she hasn’t qualified. Her 5:29 marathon in New York would only suffice if she were eighty. Tom is one weird dude, but I don’t think he’s making babies with an octogenarian. If she’s interested, Katie will have to run Boston under other auspices. People run Boston without qualifying, either through sponsorship or by supporting charity. Both options are legitimate, even fabulous. But somehow I find callow celebrity participation irksome. Am I simply jealous? Maybe. I’m certainly not surprised that the wealthy and illustrious get preferential treatment. Let’s assume celebrities give regularly to charity (though I’m not sure Scientology counts). It’s unlikely that they need to give further via marathoning. And they almost certainly don’t require a corporate exemption. Stars run races like New York and Boston because these races are, well, New York and Boston. Luminaries participate because they can. But Joe Six-Pack can’t enter these races on a whim. New York features a lottery system, and Boston’s standards have become legend. Jumping directly to the exclusive, high profile marathons smacks of privilege and entitlement; not something that would play well with the tabloid set. One must take Hollywood gossip with a rather enormous grain of salt. Katie may never have intended to run Boston. But it’s just as likely that she backed off because of potentially caustic publicity. If so, score one for the purists, or at least the grocery store check-out straw poll. I’d accept celebrity participation in Boston more readily if these folks first paid their dues running plebeian marathons like New Jersey or Myrtle Beach (regardless of finishing time). I just want them to take running seriously. Run a half marathon, local 5k, family fun run or something. Throw the running gods a bone. Thankfully, some stars get it. Will Farrell proved himself by working down to a sub-four hour marathon. He treated our sport respectfully, and purged his engrams with sweat. That’s worth a few more movie tickets in my book. I swear, if I read in The Enquirer that Brittney is running Boston, I’ll blow a gasket. Allow me to introduce you to Buster Martin. Buster was born in 1906 when King Edward VII (son of Queen Victoria) reigned over England. He just turned 101 years young. He’s not the sort of guy who idly watches the EastEnders, dully awaiting the inevitable. He works a regular schedule at Pimlico Plumbers in London and has been honored as the oldest employee in the United Kingdom. This man is tough. He famously refused to take the day off for his 100th birthday. When mugged last year by three men, he fought back, kicking one poor chap square in the gonads. He’s fathered 17 children and holds a side-job that would make most males three-quarters his age jealous. He’s a special contributor for FHM magazine. Really. And his name is Buster, which automatically makes him tougher than you. So keep Buster’s achievements under your hat. And for Prefontaine’s sake, don’t tell anyone about the Joggler, or all will be lost. Who said these things? …Lance Armstrong. He spoke these words after finishing his first marathon. At New York, he met his goal of a sub-three hour race. Yeah, this is the Lance. Lance the winner of 7 consecutive Tour de France bicycle races. Lance the superbly conditioned athlete. Lance the humbled. …Lance the marathoner. Dean ran the Kiawah marathon this past Monday. He did it in 4:08:28, unfortunately not enough for Boston (he needed 3:20). Actually, the Deanster did the race route in 4:23:37, but due to a wrong turn, he ended up going 27.8 miles rather than the standard 26.2. There’s just one thing; Dean is not me. I’m talking about Dean Karnazes, a different Dean altogether. Karno Dean. He’s a… well… he’s a pretty accomplished runner (in the “more machine now than man, twisted and evil” mold). He runs ultra-marathons as a rule, and holds the world’s record for longest continuous run at 350 miles. Yes, miles. Recently, a businessman took a year off to do 50 marathons in one year. 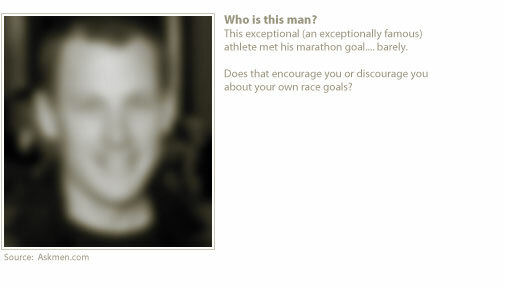 Perhaps that inspired Dean, so he decided to run 50 marathons in 50 states in 50 days. What took one guy a full year, Dean will do in about 7 weeks. On Sunday, he will finish his 50th marathon in as many days in New York City. Naturally, he also writes a daily blog. If I hear that he’s doing his taxes on the phone while running, I may keel over. No, I’d probably believe it. It just goes without saying that this Dean is not me. To differentiate, I’ll refer to him as “Big Dean”. Actually, a bloke named Sam Thompson apparently has outdone Dean, running 51 marathons in 50 days for victims of hurricane Katrina. He didn’t have nearly the promotional resources of his counterpart, but I love the moxie. I get tired just thinking about this. On Monday, I will have completed reading Big Dean’s 50 blog entries in 50 days, and after that alone, I’ll be exhausted and in need of a break. Just call me lil’ Dean.